Working with Caroline helps you get back on track towards reaching your goal of awesome health and living your Truth. When you feel good in your body, you feel unstoppable, vibrant, like you can take over the world. Caroline works with your energy, your Guides, Angels and Teachers in order to help you get to the heart and root of what is preventing you from achieving the health and body you so desire for yourself. Caroline also activates and restructures your etheric DNA strands for better health and deeper spiritual connection. She helps you get back into your body, bring balance into your busy life, reclaim your desired body weight, find out where you got off course, gave your power away, and helps you find practical ways to get back on track. Caroline utilizes her 20 years of experience to help you become the highest and healthiest version of you! All sessions are done via zoom and are recorded and emailed out afterwards. *You can have your DNA activated and restructured, so that your body can heal much deeper and quicker. *You will begin releasing energetic allergies literally keeping you feeling like crap as well as holding extra weight onto your body. *You will release the energetic blocks (beliefs, thoughts, past life issues, etc) that are holding you back and keeping you stuck (and sick). *You will receive action steps just for YOU to help you reach your goal of way better health. *You will learn to lighten up and not take everything so darn serious. It's only life after all. *You will feel awesomely relaxed, peaceful and empowered. Schedule YOUR 1:1 session below! 6 month group program is the answer! Want to fast track your healing? Cancellation policy is as follows: If you find you cannot make a session with Caroline, kindly cancel your appointment within 24 hours. If you fail to do this, you will be charged the price of your session. Your time is valuable as is Caroline's, so please be respectful. Also, if you are late for your appointment, that is on you. Being later than 15 minutes for your session means you are not taking this seriously and no refund will be given (unless you have a very awesome excuse and even then it is up to Caroline as to whether you will be refunded). Things come up, but also be aware that when you are making life changes, your Ego can be quite stubborn and come up with all kinds of ways to distract you from your goals. Knowing this up front can help you stay the course towards Finding your Inner Awesome. Also please be advised that Caroline does not diagnose anyone or any condition. She is not a doctor, nor does she claim to be. Caroline works with the energetic field of the body only. All sessions are non-sexual as well. As you are a unique soul with different experiences, perspectives, thoughts and feelings, so are the sessions. There is no one session that fits everyone. Each session is designed to meet you, oh awesome one, where you are on your path right now. How cool is that? Every session is different, unique and totally awesome. Oh and if you are opposed to laughing, don't bother making an appointment, because I believe that laughter is healing and people really do need to lighten up, like a lot. If you need medical/psychological help, please advocate for yourself. Oh and all intuitive messages are from Spirit. Always check in with yourself anytime anyone gives you advice of any kind!! I had the pleasure of working with Caroline individually, as well as part of her Releasing Weight With Spirit group and most recently DNA Activation and Restructuring. What can I say? There are people who touch our lives at certain points on our life’s journey. We are forever changed and forever grateful for having met them and for the growth they have helped us to achieve. Caroline is one such person in my life. I was going through a divorce when we first met, and wanted to chart a new direction in my life’s journey, not knowing how to make the leap. Caroline gifted me with support, understanding, guidance, and an arsenal of tools to deal with the ups and downs in life. I value her tremendously. Caroline’s expertise, insight, empathy, intuitive knowing and support is a gift to all fortunate enough to work with her. Caroline’s most recent DNA Activation and Restructuring, Part II, came at a synchronistic time in my life, as well. It is helping me in my roles as mom, therapist, friend, daughter, etc.--- even navigating the dating waters! And doing all in such a way as to bring ease and allow for more personal growth, and to bring healing to those I come in to contact with. Caroline's time, talent and gifts are helping me to develop mine! I recommend Caroline without reservation. She is a true blessing in my life. Caroline, thank you for your authenticity and beautiful Spirit. You have helped, and continue to help me realize the Divine Spark within. I started with Caroline feeling completely stuck, like a weight loss failure (seriously nothing worked! ), and with serious issues of emotional eating and self sabotage. This group not only helped my weight loss issues but holistically changed me. I walked through all my junk with Caroline’s help and came out stronger and healthier! I now choose to eat healthy, haven’t been to Dunkin’ Donuts in months (I was a daily customer), I crave the gym, and have lost weight and inches. Caroline’s commitment to you is visible and her energy is so much fun! Thank you so much Caroline! I’ve loved working with you over the past 5 days in the Business Bootcamp. You're an amazing and insightful healer and teacher. As well as guidance on the practical action steps to build a successful healing business, I’ve come away with so many tips and tools to support myself and my business energetically - and I’ve already started to feel the difference. And of course all your magical healing has been amazing. I am SO glad I decided to do this work with you, and I know it will make all the difference to my business going forward. Much appreciation! I want for a minute to sing the praises of Caroline. 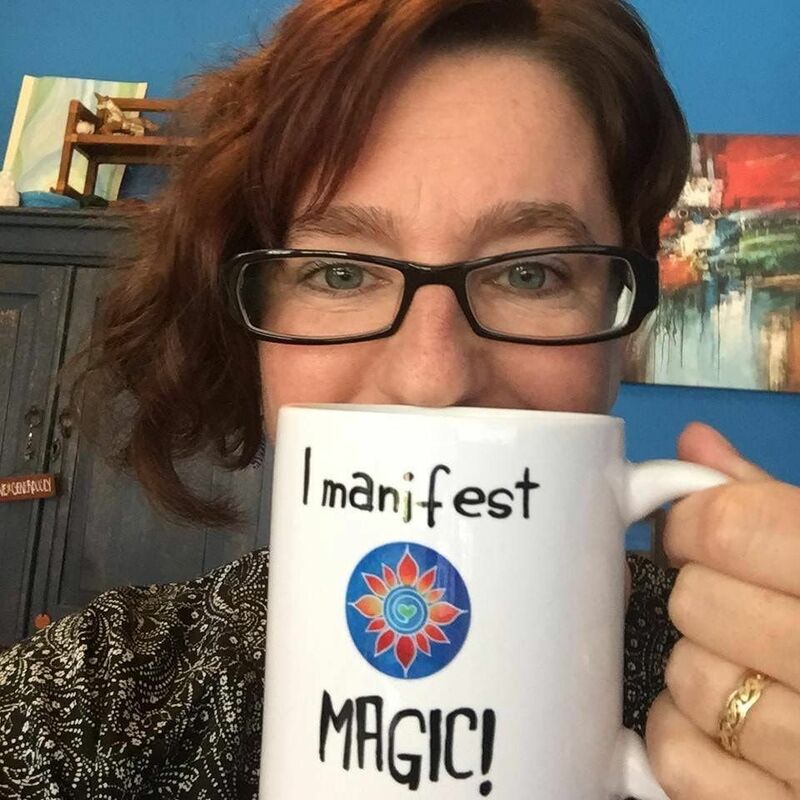 I have just finished her Manifesting Your Magic Beta Program and it was Awesome. The Sacred Soul Alignments have been great and right on. And the Chakra work really helped me to see where the blocks are. If this program rolls out live again, I highly recommend it. Caroline is a gifted healer and mentor. She just takes your safety box and moves it right out of the way for you to go forward with your dream/goal. Thank you for doing all you do Caroline to make this world a better place. And a side note, if any of you have adrenal fatigue issues, get Caroline to do the Scared Soul Alignments for the adrenal glands. I have been dealing with Adrenal issues for a couple of years and feel better now than I have in those same years. I have loved every moment in this boot camp. You are such a wonderful teacher and mentor!! This is the second boot camp I have done with you and I'm sure many more to come! The action steps that you intuitively give are always perfect for my soul. You have giving me so much information, tools, and ideas moving forward in my business. OH and all the healings as always is absolutely perfect!! I know I will work with you again soon! I got an Akashic reading done from Caroline and what an experience! The information she came back with was spot on and clear, making perfect sense in my current life. I especially loved the thought of clearing anything negative from the past away to ensure optimal success in the now. I am grateful for the experience and would recommend it to anyone. I recently met with Caroline Nixon to have a Soul Realignment session. I was impressed by her enthusiasm and knowledge of the subject matter. Caroline explained the scope of the work clearly and helped me to understand her process and what to expect. The results of the reading were spot on. She was confident in her ability to clear the issues she uncovered, but left some of the work of completing the healing to me. As I worked through the 21 days of "homework", I had several "aha" experiences that confirmed that I was on a good track. I recommended the work to friends immediately, and continue to do so. Caroline is a pleasure to work with. After trying to get pregnant for nearly a year, I realized that not conceiving was the result of an underlying issue. Soul Realignment with Caroline helped clear my mind, refocus my energy, and become more susceptible to the things in life that have always made me truly happy. After 1 month, and the completion of my 21 day program, my husband and I are now happily expecting. Thank you Caroline for your hard work, dedication and friendship. How you discovered more about me, than I knew about myself is still a mystery! I did it! I got an Akashic Record reading from Caroline that was not just insightful but really specific! Caroline has an amazing and FUN energy that made it a delight. But I digress, back to the specifics! SHE nailed my manifesting energy and was dead on. Impressed yes! While that was fun and good to know in a very useful way she also shared plenty of other gems for me to be aware of, work on AND she fixed some for ME! Hello happy! Not only did the "thing" stay fixed, I felt it lift right away. My other fave thing is that she used crystals- oh my love affair with the talking crystals stole my heart. I love it when a healer separates a gift that many can do and makes it their own through personalization, which she does in more ways than one beautifully! Thank you, thank you, thank you Caroline for an amazing session. Reading this and on the fence about what it can do for you? Get one, there is no way she is going to have time or be this price for long!